In the past several years Kentucky residents have heard and read much back and forth regarding compliance with federal regulation, or rather the lack thereof, in relation to the Kentucky driver’s licenses. According to the Kentucky Transportation Cabinet, the state will very soon finally be compliant with new federal requirements of the REAL ID act, that requires new compliant IDs before the holder will be allowed to board U.S. domestic flights, in addition to being allowed access restricted federal buildings and military bases. The rollout of the new system that will allow the production of the new cards, will take place across the state in anticipated phases. According to information supplied to the Clinton County News by Clinton County Circuit Clerk Jake Staton, local residents can expect the rollout to get to the local circuit clerk’s office between April 15 and April 19, 2019. The Cabinet is spearheading the Confident Kentucky initiative to offer two new license, permit and personal ID card versions applicants can choose from the next time they are due to renew existing credentials at their local Circuit Court Clerk office. The new system is expected to be in place statewide by May and is part of an effort to introduce a new REAL ID compliant credential by boosting the security of all card production and issuance. Applicants requesting a new Voluntary Travel ID or those applying for a license, permit or personal ID for the first time must present documentation verifying identity, social security number and residency. Kentuckians are urged to prepare now by gathering documentation and making any necessary updates. 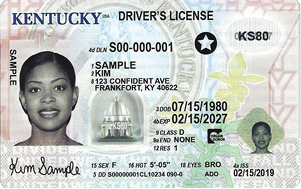 Upon implementation, Kentuckians will choose between a new standard or Voluntary Travel ID card version once they are within six months of their current card’s expiration date. All new card versions will be mailed to applicants five to 10 days after applying at their local Circuit Court Clerk Office. A Kentucky driver’s license, permit or identification card in the current and new standard version will continue to be accepted for U.S. air travel and military base entry through Aug. 1, 2019. Kentucky expects to maintain further extensions from the U.S. Department of Homeland Security (DHS) until REAL ID enforcement begins October 1, 2020. At that point, a new Voluntary Travel ID card version or any federally accepted form of identification, like a passport, will be needed for airport security checkpoints and entry into military bases or restricted federal buildings.